The bartender plops a little glass of clear liquid in front of me, accompanied by a small plate of salt, candied fruits, fried crickets, and limes. It’s Dia de Los Muertos in Mexico, which means it’s time to drink a little (or a lot). But what was the clear drink in front of us? Was it tequila, or was it mezcal? What was it made of? Was there actually a difference at all? We asked the bartender, and he was all too happy to help us learn more about the history of tequila and mezcal. It all starts with a special spikey plant. Agave grows wild all across western Mexico, but most of the wild agaves that you see aren’t the right species for tequila. Tequila is primarily produced in Mexico by fermenting blue agave (Agave tequilina), a single species of agave. In fact, most tequila comes from a specific cultivar of the blue agave called the Weber Azul. The blue agave grows primarily in the Mexican state of Jalisco, but can also be found in neighboring states of Colima, Nayarit, and Aguascalientes. It grows above 5,000 feet in altitude in rich and sandy soils. Reaching heights of five feet or more, the blue agave has leaves that are longer than your arm. These leaves are hacked off during the harvesting process to reach the heart (or piña) within. Blue agave is pollinated by the greater long-nosed bat. Thanks, bats! Unfortunately for biodiversity, farmers mostly grow blue agave by planting shoots rather than via seeds. The heart of the agave will grow bigger if the reproductive stalk is removed, so long-nosed bats don’t have many flowers to eat in areas dominated by farms. This reproductive method results in a loss of genetic diversity because there’s no genetic mixing between parent plants. This leaves blue agave vulnerable to disease and blight. Tequila must be made from 51% blue agave or more, otherwise, it is not legally considered tequila (you read that right, there’s a law about that in Mexico). Mixto tequila is considered to be of lower quality and is usually filled with cane sugar alcohol. 100% agave tequila is considered higher quality. Tequila is made from the heart of the agave, which is harvested when the plant is at least eight years old. The massive heart can weigh as much as 240 pounds! Tequila hearts are roasted, smashed, and fermented to make tequila. Tequila production is rather tightly controlled by the Consejo Regulador del Tequila. In fact, tequila is a protected product of Mexican origin in dozens of countries (similar to Champagne). Mezcal, in contrast, can be made from one of the 30 different species of agave that grow in Mexico. This means that tequila is technically a mezcal, but not all mezcals are tequila. 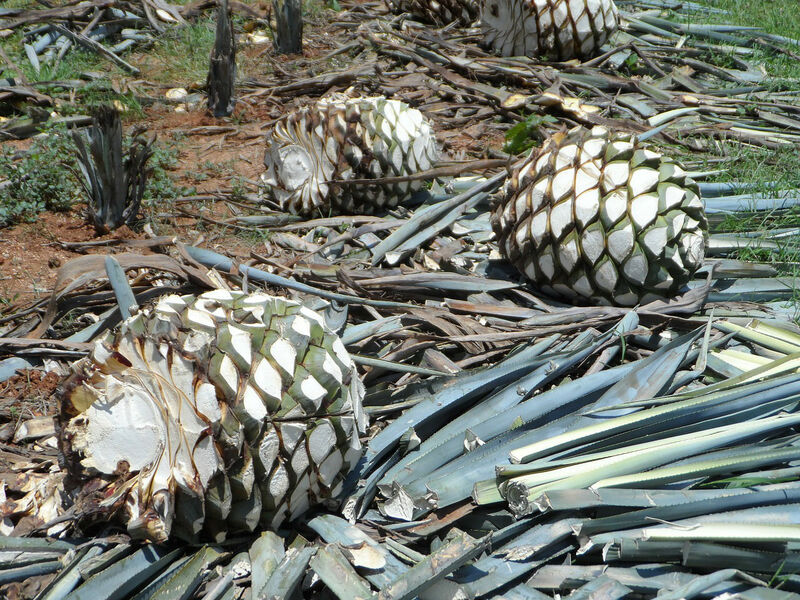 Most mezcals are made with agave espading. But many regions and distilleries have their own recipe! Mezcal is primarily produced in Mexico in the state of Oaxaca. It can also be produced in the states of Guerrero, Zacatecas, Guanajuato, Tamaulipas, San Luis Potosí, Durango and Michoacán. Like tequila, mezcal produced elsewhere is labeled as an “agave-distilled spirit.” These spirits are rarely sold outside of Mexico. It can be made from a mix of agaves or just one species. Some of the mezcal sold to this day is still produced from wild agave. This offers unique flavors that can be quite varied (and delicious). Mezcal traditionally has a richer, sweeter, and smokier flavor than tequila – though some choose to produce mezcal that is spicy, fruity, or earthy. It’s incredibly varied alcohol because each species of agave takes up flavors from its microclimate! Like wine, mezcal has distinct varieties based on the agave used and the area that produced it (such as Espadín, Largo, Cirial, or Tripón). Mezcal traditionally gets its smoky flavor thanks to the pre-fermenting process. The hearts of the agave are harvested, then smoked in a pit prior to fermentation. Tequila, in contrast, is made from cooking the heart of agave in a brick oven. Since the plants have to be several years old, expect a bottle of nice mezcal to be pretty pricey! How Should I Drink Tequila or Mezcal? Mezcal is traditionally served with an orange slice and some sal de gusano (worm salt). Despite its name, this savory salt is a real treat! Tequila, in contrast, is generally offered “neat” in Mexico (the salt and lime show up elsewhere around the world). In Mexican pubs, crickets and other bar snacks are commonplace. The famous worm in the bottle is only found in mezcal, not in tequila. The “worm” is actually a caterpillar, not a worm at all! The production and harvest of tequila and mezcal remain largely unchanged by time and technological advances. Jimadores have intimate knowledge of the agave plants, ensuring that the plants are harvested at the correct time prior to roasting and fermentation.